The Planet Earth was launched in the Fall of 2000 as the Ethnic Module in the new Proteus '1000' range - taking over the throne from the Proteus 3. 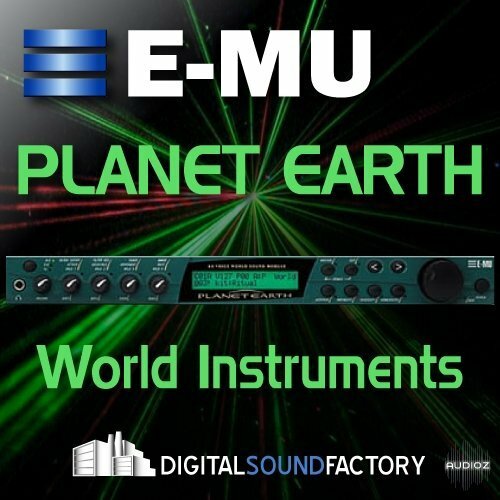 E-Mu's sound designers gathered an amazing collection of authentic rhythms and traditional instruments from the four corners of the globe to give you Planet Earth, the most realistic ethnic sound module in the world. With 32MB of samples, the Planet Earth contains a wide range of world samples - from Africa to Brazil. Planet Earth SoundFont is the professional's choice for World sounds and ethnic percussion! Discover Planet Earth and bring a world of sounds to your music. Each instrument is scripted to allow full user control over real-time MIDI controllers, just like the originals. You get instant access to filter, resonance, volume & filter envelope ADSR's, filter envelope amount, stereo image, and more. Assign your MIDI control and spin the knobs to create your own sounds on the fly!! !